This cosmopolitan pot-pourri opens with a selection of Russian pieces: Rimsky-Korsakov's Capriccio Espagnol, Mussorgsky�s Gopak and Capriccio, a Shostakovich piano Prelude and a medley of Tchaikovsky�s ballet music. We then move to the flamboyance of Spanish music by a Polish composer! Four pieces featured here from Moritz Moszkowski�s Spanish Dances receive exhilarating performances. The Berceuse from Granados� Escenas po�ticas provides a beautiful contrast in tone and colour. French music follows: Two of Delibes� balletic compositions sit alongside Debussy�s Passepied, Faur�s Song Without Words , and a movement from Ravel's Sonatine for piano, the Rigaudon from Le Tombeau de Couperin completing this delightful selection. Bizet's Carmen is loved by opera-goers throughout the world. 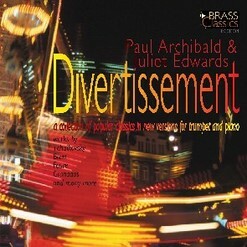 Here, Paul Archibald and Juliet Edwards perform the Prelude and Chanson Boh�me, Choeur des Gamins, Habanera, Seguedille, the Entr�acte to Act IV and the Overture.